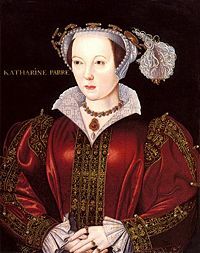 Catherine Parr (c. 1512 – September 5, 1548), also known as Katherine or Katharine Parr(e), was the last of the six wives of Henry VIII of England. She was queen consort of England during 1543–1547, then dowager queen of England. She was the most married English queen, with four husbands. One of Henry's more educated wives, Catherine displayed a keen interest in religious issues, favoring the Protestant cause, and was the first English queen to publish a book in her own name. She was also influential in the education of the royal children, especially Edward VI and Elizabeth I. Her outspoken views on religion earned her several powerful enemies at court who attempted to have Henry do away with her, but she was able to avoid this fate. After Henry's death, Catherine became the wife of her former suitor, Thomas Seymour and gave birth to her only child, a daughter named Mary. She died just a few days later at the age of 36. Catherine was the daughter of Sir Thomas Parr of Kendal and Maud Greene. She was the eldest of three children, probably born in 1512, followed by a brother, William and a sister, Anne. Thomas and Maud were courtiers during the early years of Henry VIII's reign. Thomas was knighted at the king's coronation in 1509, and Maud was a lady-in-waiting to his first queen, Catharine of Aragon after whom Catherine was named. Thomas died in 1517 and Catherine was sent to live with her uncle, Sir William Parr in Northamptonshire where she received a good education. It had been thought that Catherine married the elderly Edward Burgh, 2nd Baron Burgh in 1529, at the age of 17, but the 2nd Baron died in August 1528. More recent research of documents and the will of Catherine's mother by biographers Susan James, Linda Porter, David Starkey, and Alison Weir all confirm that she married the 2nd Baron's grandson, who shared his first name. Sir Edward Borough was the eldest son of the 2nd Baron's eldest son, Sir Thomas Borough, who would become the "3rd Baron" after his father's death. At the time of his son's marriage, Thomas, was thirty-five which would have made the younger Edward around Catherine's age. He died in the spring of 1533 never fulfilling the title of Lord Baron Borough. He and Catherine had no children. In the summer of 1534, aged 22, she married John Nevill, 3rd Baron Latymer of Snape, North Yorkshire. He had two children, for whom Catherine reportedly cared well. Neville and Catherine, as well as the two children, were held hostage in 1536 by northern rebels who fought against King Henry's religious policies during the Pilgrimage of Grace. Afterward, her husband had to report to the king about his imprisonment and soon died, in March 1543. Catherine had no children with Neville. As Catherine nursed the ailing Neville near the end of his life, she spent more time at court, where she became acquainted with vital young men her own age. At 31, she was a wealthy young widow and began a relationship with Thomas Seymour, the brother of the late queen Jane Seymour and uncle to the future king, Edward VI. During this time, Catherine also spent time in the household of Henry VIII's daughter by Catherine of Aragon, Mary. It was here that Catherine caught the attention of the king. Henry took a liking to her, and she was obliged to accept his proposal of marriage instead of that of Thomas Seymour. A dutiful woman, Catherine entered into her third marriage with an older, sickly husband. It was not easy for her, and she wrote to Seymour: "As truly as God is God, my mind was fully bent... to marry you before any man I know. But the will of God was different." Catherine and her siblings were educated at their mother's direction after the death of their father in the hope of securing good marriages. Catherine was fluent in French, Italian, and Latin, and began learning Greek, and some sources say Spanish, when she was queen. She would also become a patron of the arts and music. In 1545, she was the first English queen to publish a book under her own name: “Prayers or Meditations.” Her other book, “The Lamentations of a Sinner,” was published after the death of Henry VIII during the last year of her life. Catherine married Henry VIII on July 12, 1543 at Hampton Court Palace, becoming his sixth wife. She was the first English queen consort to enjoy the new title Queen of Ireland following Henry's adoption of the title of Ireland's monarch. As queen, Catherine was partially responsible for reconciling Henry with his daughters from his first two marriages, who would later become Queens regnant, Mary and Elizabeth. She also developed a good relationship with Henry's son Edward, who preceded his sisters to the throne as Edward VI. When she became queen, her uncle Baron Parr of Horton became her lord chamberlain. 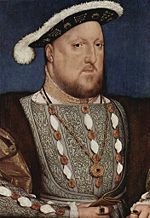 Henry VIII King of England and Ireland. Portrait by Hans Holbein the Younger. Their marriage was consummated, although Henry was reportedly occasionally impotent. Catharine was known to order black satin nightdresses and would sit holding the king's infected leg in her lap, or sit in his lap herself. They both loved music and she would dance for him. Their marriage seemed a happy one, even though lacking in passion. For three months, from July to September 1544, Catherine was appointed queen regent by Henry as he went on his last, unsuccessful, campaign in France. Thanks to her uncle having been appointed as a member of her regency council and to the sympathies of her councilors Thomas Cranmer and Edward Seymour, earl of Hertford, Catherine obtained effective control and faced no serious challenge to her authority. She handled provision, finances, and musters for Henry's French campaign. She also signed five royal proclamations and maintained constant contact with her northern lieutenant, the Earl of Shrewsbury, over the complex and unstable situation with Scotland. It is thought that her actions as regent, together with her strength of character and later religious convictions, greatly influenced her stepdaughter Elizabeth. Catherine's religious views were complex, and the issue is clouded by the sparseness of evidence. Although she must have been brought up as a Catholic—given her birth before the English Reformation and her being named for the Catholic Catherine of Aragon—she later became sympathetic and interested in the "New Faith." She and her younger friends had grown up after Martin Luther's triumph in Germany. Evangelical Protestantism was attractive to her with its emphasis on freedom of Christian conscience and the individual's reading of the Bible. She drew young thinkers to her, like Miles Coverdale, John Parkhurst, Anthony Cope and others. She also became close friends with Thomas Cranmer, the archbishop of Canterbury, and Catherine Willoughby, the duchess of Suffolk, another young, educated woman with an elderly husband. Catherine clearly held strong reformed ideas after Henry's death, when her Lamentacions of a synner (Lamentations of a Sinner) were published in late 1547. However, her commissioning of the translation of Desiderius Erasmus' Paraphrases implies that she may have been influenced by Erasmian humanism and pietism. Catherine was reformist enough to be viewed with suspicion by Catholic and anti-Evangelical officials such as Bishop Stephen Gardiner and Chancellor Thomas Wriothesley, 1st Earl of Southampton who tried to turn the king against her in 1546. Angered, she wrote, "Is it not extreme wickedness to charge the holy sanctified word of God with the offenses of man? To allege the Scriptures to be perilous learning because certain readers thereof fall into heresies?" The king's council soon became alarmed by the permissive religious climate and passed the Act for the Advancement of the True Religion. It disallowed the "lower sort" from studying the Bible in English but was later amended to allow noblewomen the right to read the scriptures but stipulated that they should not engage in religious debate. Catherine, feeling secure in her position at court, ignored the law and continued to engage in religious discussions. Her friend Anne Askew was arrested and horribly tortured, but refused to implicate the queen. When Anne was executed, Catherine threw away her most dangerous evangelical books. Since the king still showed much affection toward her, she felt she was safe. But her Catholic enemies conspired to have her removed and punished, as they did with Thomas Cromwell for his part in arranging Henry's marriage alliance with the strongly Lutheran family of Anne of Cleves. A warrant was drawn up for Catherine's arrest. A copy of the warrant was left at Catherine's door allowing her to prepare herself to meet the king. When the king confronted her about her religious arguments with him, she humbly told him that a wife was subordinate to her husband in all things and managed to reconcile with him, after vowing that she had only argued about religion with him to take his mind off the suffering caused by his ulcerous leg. This won his heart, and he reportedly declared: "Then Kate, we are friends again." However, the king's council had not yet been informed of the reconciliation. When Wriothesley and 40 guards came with the warrant to arrest Catharine the next day, the king himself defended her, beating and cursing them. Henry also gave her gifts of jewels in expression of his satisfaction with her. Henry VIII died in January 1547, leaving Catherine one of the wealthiest women in England. Meanwhile, her former suitor Thomas Seymour had risen to high office supervising the nation's military affairs. He returned to court a few months before Henry's death and saw his brother Edward become Lord Protector of England, in effect the ruler of the realm as regent for the young Edward VI. 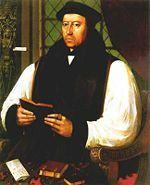 Thomas was granted the title Baron Seymour of Sudeley and was also Lord High Admiral, but now schemed to replace his brother as Lord Protector. Although Catherine was expected to play the role of dowager queen for the new nine-year-old king, just a few months after Henry’s death she secretly married Thomas Seymour. Despite the ensuing scandal, Catherine was able to secure the guardianship of Princess Elizabeth, as well as the wardship of the king’s cousin, Lady Jane Grey. Having had no children from her first three marriages, Catherine became pregnant for the first time at age 35. But her happiness was short-lived. Thomas Seymour was alleged to have taken liberties with the teen-aged Princess Elizabeth, and allegedly plotted to marry her. To protect Elisabeth, Catherine had to send her to live in another household, which caused a permanent rift between them. Catherine gave birth to her only child—a daughter, Mary Seymour—on August 30, 1548. Catherine died only six days later, on September 5, 1548, at Sudeley Castle in Gloucestershire, from puerperal fever, just as Jane Seymour had done before her after giving birth to Edward VI. Thomas Seymour, still ambitious, was caught breaking into the young king's palace. He was sent to the Tower of London, charged with 33 counts of treason, and beheaded less than a year later. Their daughter, Mary, was taken to live with Catherine (Brandon) Willoughby, dowager duchess of Suffolk, who had been a close friend of Catherine. After a year and a half, Mary's property was restored to her by an Act of Parliament, easing the burden of the infant's household on the duchess. The last mention of Mary Seymour on record marks her second birthday. Although stories circulated that she eventually married and had children, most historians believe she died as a child. Although she loved Thomas Seymour, Catherine Parr sacrificed her own desires and entered into a marriage with Henry VIII with dignity and moral fortitude. This example of loyalty to the crown kept her in good reputation throughout English history. Favoring education, and culture she also helped reconcile her three step-children to Henry VIII. She brought the reformist-minded scholars John Cheke and Roger Ascham to be tutors to young Prince Edward. She also strongly encouraged Elizabeth's education, which allowed the future Queen Elizabeth to become one of the most learned monarchs in English history. Catherine's support of the "new religion" encouraged the translation of religious works into English and furthered the cause of the Protestant Reformation in England. In 1782, a gentleman by the name of John Locust discovered the coffin of Queen Catherine at the ruins of the Sudeley Castle chapel. He opened the coffin and observed that the body, after 234 years, was in a surprisingly good condition. When the coffin was officially reopened in 1817, nothing but a skeleton remained. Her remains were then moved to the tomb of Lord Chandos, whose family owned the castle at that time. In later years the chapel was rebuilt by Sir John Scott and a proper altar-tomb was erected for Queen Catherine. The popular myth that Catherine acted more as her husband's nurse than his wife was born in the nineteenth century from the work of Victorian moralist and proto-feminist, Agnes Strickland. This assumption was challenged by David Starkey in his book Six Wives, in which he noted that King Henry had a large staff of physicians waiting on him hand and foot, and Catherine was a woman expected to live up to the heavy expectations of Queenly dignity. Catherine's good sense, passionate religious commitment, and strong sense of loyalty have earned her many admirers among historians. Catherine also stands out as the first English queen to publish books in her own name, encouraging others toward religious dialog and contemplation. She was a courageous yet moderate pioneer for women in an age when to think, let alone to speak and write, on religious matters was a dangerous act. Some of Catherine Parr's writings are available from the Women Writers Project at Brown University. ↑ 1.0 1.1 1.2 Linda Porter, Katherine, the Queen (New York, NY: St. Martin's Press, 2010, ISBN 978-0312384388). ↑ Charles Mosley (ed. ), Burke's Peerage, Baronetage & Knightage, 107th edition, Vol. 1 (Wilmington, DE: Burke's Peerage (Genealogical Books) Ltd, 2003, ISBN 978-0971196629), 587. ↑ Susan E. James, Catherine Parr: Henry VIII's Last Love (Gloucestershire, England: The History Press, 2009, ISBN 978-0752448534), 60-63. ↑ Catherine Parr's life englishhistory.net. Retrieved May 25, 2008. ↑ The life of Catherine Parr tudorhistory.org. Retrieved May 25, 2008. ↑ David Starkey, Six Wives: The Queens of Henry VIII (Harper Perennial, 2004, ISBN 978-0060005504). ↑ Women Writers Project www.wwp.brown.edu. Retrieved May 25, 2008. This page was last modified on 19 January 2017, at 16:24.